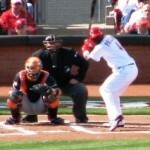 Opening Night is tonight, but there’s still a little bit of time left to relive some of that Opening Day magic. 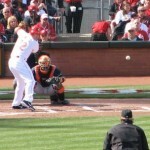 Here are some pictures from the game. 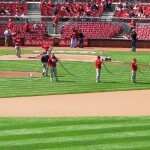 The grounds crew makes the final preparation before the first pitch. 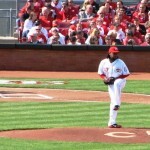 Brandon Phillips awaits the first pitch of the 2012 season. 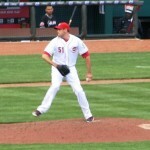 Zach Cozart prepares for his first Opening Day at bat. 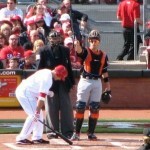 Joey Votto goes through his at-bat ritual before his first 2012 at bat. 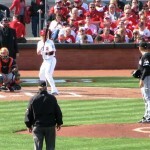 Joey Votto sees the first pitch from Mark Buehrle. 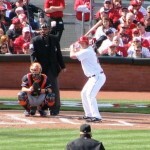 Scott Rolen bats for the first time in 2012. 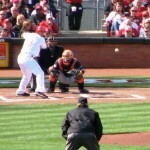 The first pitch of Jay Bruce’s at bat that would produce the Reds’ first run. Sean Marshall pitches the 9th inning to close out the win. 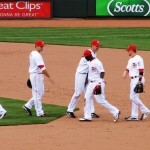 Brandon Phillips greets Scott Rolen after the Opening Day win. 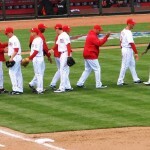 The Reds high-five each other in the middle of the field after winning the first game of 2012. 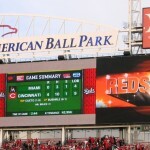 The scoreboard after the win.